VIENNA --- Schiebel, in cooperation with ELTA Systems and Overwatch Imaging, integrated two new payloads for an active army exercise. The Australian Army conducted a two-week activity with the CAMCOPTER S-100 Unmanned Air System (UAS) to gain further insights into future capabilities and payloads in support of Project Land 129-3. Specifically, they tested ELTA Systems’ state-of-the-art ELK-7065 Compact Airborne HF COMINT/DF 3D System during the first week, followed by Overwatch Imaging’s game-changing TK-5 Firewatch during the second week of the exercise. As the market leader in Vertical Takeoff and Landing (VTOL) UAS, the multi-payload capable S-100 offers a proven platform for military and civilian applications on land and at sea. It operates day and night, under adverse weather conditions and with a beyond line-of-sight capability of up to 200 km. The combination of the CAMCOPTER S-100 and the ELK-7065 offers a remarkably flexible high-frequency (HF) communications intelligence (COMINT) capability that provides rapid spectrum exploration, analysis and detection of advanced HF communication signals in real time and with off-line analysis tools. Furthermore, it is suitable to operate in harsh electromagnetic environments. Overwatch Imaging’s TK-5 Firewatch payload, which was tested during the second week of the exercise, bridges the gap between small drone mapping cameras and satellite mapping systems. The wide-area multi-band land mapping with automatic small object detection enables regional-scale applications in real time with optimal resolution. It includes color, near infrared (NIR) and temperature-calibrated thermal longwave infrared (LWIR) sensors that operate at the same time, including simultaneous on-board image processing. Integrated on the CAMCOPTER S-100, it becomes an extremely powerful asset for intelligence, surveillance and reconnaissance (ISR) missions. Schiebel’s CAMCOPTER S-100 Unmanned Air System (UAS) is an operationally proven capability for military and civilian applications. The Vertical Takeoff and Landing (VTOL) UAS requires no prepared area or supporting equipment to enable launch and recovery. It operates by day and by night, under adverse weather conditions, with a beyond line-of-sight capability out to 200 km / 108 nm, over land and sea. Its carbon fiber and titanium fuselage provides capacity for a wide range of payload/endurance combinations up to a service ceiling of 5,500 m / 18,000 ft. In a typical configuration, the CAMCOPTER S-100 carries a 34-kg / 75-lbs payload up to 10 hours and is powered with AVGas or JP-5 heavy fuel. High-definition payload imagery is transmitted to the control station in real time. In addition to its standard GPS waypoint or manual navigation, the S-100 can successfully operate in environments where GPS is not available, with missions planned and controlled via a simple point-and-click graphical user interface. The high-tech unmanned helicopter is backed by Schiebel’s excellent customer support and training services. 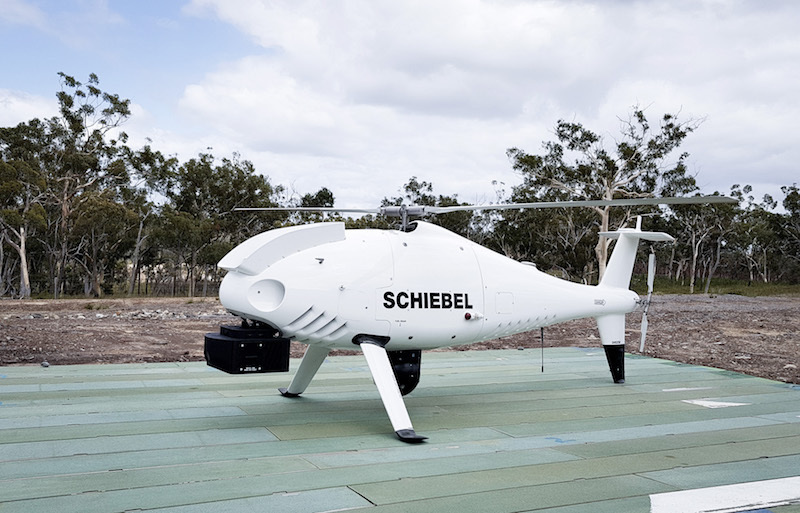 Founded in 2018, Schiebel Pacific Pty Ltd (SPL) is the Australian subsidiary of the Schiebel Group, which focuses on the development, testing and production of the revolutionary CAMCOPTER S-100 Unmanned Air System (UAS). The Australian base provides the Pacific region with a permanent and comprehensive program, logistics and sales hub and shows a commitment to supporting and contributing to the local industry.